The Pryor Mountain Wild Mustang Center is dedicated to preserving the future of the wild horses of the Pryor Mountains. Inform visitors of the historic significance of the local mustang herd. Provide visitors with an unforgettable experience, viewing live mustangs in a magnificent setting. Educate visitors to learn about the dynamics of a mustang herd, the social interactions within individual bands, and the mustang’s place alongside other wild species. Work collaboratively with the Bureau of Land Management and the National Park Service to preserve and promote a genetically viable herd of wild horses in the Pryor Mountains. 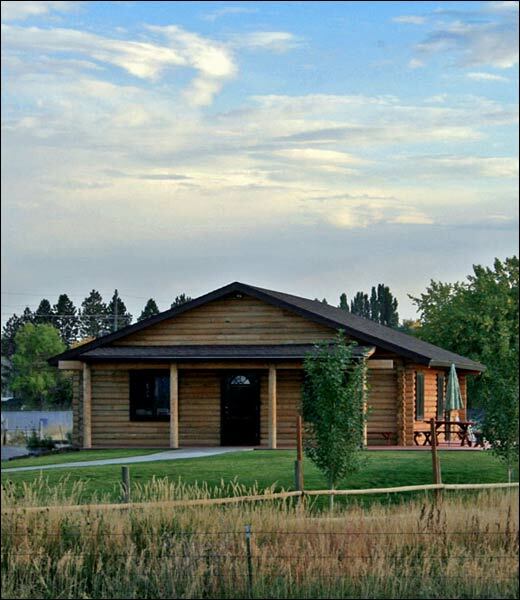 The Pryor Mountain Wild Mustang Center is currently housed in a 30′ x 40′ log building located in the northeastern corner of the Center’s 12 acre property. At the Center, visitors can learn about the color, conformation, and behavior of the Pryor Mountain Wild Horses as well as the history of the Pryor Mountain Wild Horse Range. Visitors can learn how and where to best view the wild horses as the Center keeps track of the current location and status of individual horses. The Center also offers a selection of items for sale in the gift shop related to the Pryor Mountain Wild Horses with several of the items sold exclusively in the Center. 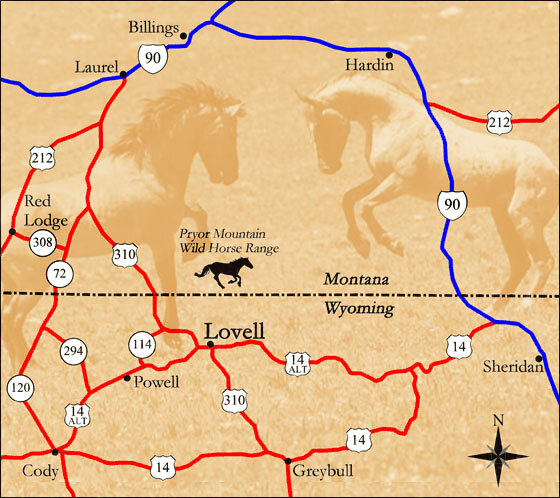 The Pryor Mountain Wild Mustang Center is located just east of Lovell, Wyoming on Highway 14A. The Center is east of the Cal S. Taggart Bighorn Canyon National Recreation Area Visitor Center. Summer hours at the Center will be Mon-Sat, from 9:00AM – 5:00PM. These hours will go into effect after Memorial Day. Winter hours at the Center will be Mon-Fri, from 10:00AM – 3:00PM. These hours will go into effect starting on Oct. 1st, but may vary. For more information on visiting the Center, please call us at (307) 548-9453. Nancy Cerroni is the Curriculum Director for Big Horn County School District #2 in Lovell. She has been actively observing the Pryor Mountain Wild Horses since the early 2000’s. Nancy enjoys bringing her worlds of education and wild horses together through educational programs presented in the local area. Nancy and her husband, Steve, share the Pryor horses with their tour business, PryorWild. John Nickle is a former mayor of Lovell and President of the Wyoming Association of Municipalities with years of experience in oversight of municipal and regional construction projects. John has been supporting and observing the wild horses since the mid 1960’s. Matthew Dillon was born and raised in Lovell, Wyoming. After receiving his B.S. in Environmental Science, he started working as the first Director of the Pryor Mountain Wild Mustang Center. Matthew lives in Lander, WY with his wife and young son. He works for the Department of Environmental Quality. Diane Granger moved from New Jersey to Lovell in 1993 with her husband Wally. She enjoys hiking in the Pryor Mountain Wild Horse Range. Diane now owns four Pryor Mountain Mustangs (including Liesl and Kaibab) along with other critters. Jason Beal is a native of Lovell, WY and has always had an interest in the Pryor horses. Jason is the Emergency Management Coordinator for Big Horn County. He also works for the Big Horn County Sheriff’s Office as a Patrol Deputy Jason has taught at Lovell Middle School and continues to coach there. LaMoine Sorenson-Vice President. Deaver, Wyoming. Mr. Sorenson is a partner in his family”s electric power transmission construction business. He also ranches close to the Pryor Mountains. Dr. Sponenberg is a professor of Pathology and Genetics at Virginia Tech. Dr. Sponenberg has written many articles and books about wild horses and has studied the Pryor horses for many years. Dr. Sponenberg continues to provide help with identifying the horse coloration of individual horses.